Archaeologists excavating in Jerusalem discovered a small stamp seal (a clay emblem that would be used to mark documents with a signature) in the 1980s belonging to a certain Malkiyahu ben hamelek, or Malkiyahu son of the king. 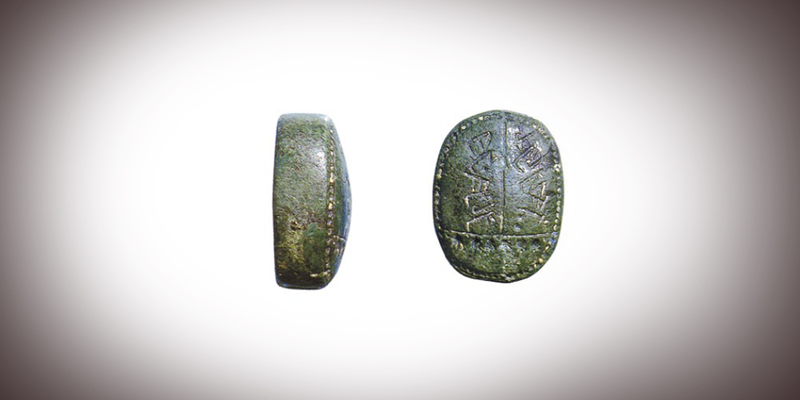 Dating to the late 7th to early 6th centuries BC, “The oval-shaped stamp seal of Malkiyahu ben hamelek was fashioned of bluish green malchite stone and is very small, measuring just 15 mm long by 11 mm wide (smaller than a dime) and only 7 mm thick.” Although small, this stamp seal carries great importance for establishing the historical existence of one of the Bible’s more enigmatic figures, and potentially for a Book of Mormon personality. Jeremiah 38 tells how the prophet Jeremiah was cast “into the dungeon [Hebrew: “the pit”] of Malchiah the son of Hammelech” (KJV Jeremiah 38:6). While the King James Bible incorrectly rendered it as a proper name, Hammelech (ha-melech) in Hebrew is “the king.” This is reflected in modern Bible translations: “So they took Jeremiah and threw him into the cistern of Malchiah, the king’s son” (NRSV). The name rendered Malchiah in the Hebrew of this passage is Malkiyahu, exactly as the name on the stamp seal, meaning “Yahweh is king.” (This name is composed of the Hebrew elements mlk, “king,” and yhw, an abbreviation of the divine name Yahweh.) Accordingly, it is highly likely that the Malkiyahu on the stamp seal is none other than Malchiah in Jeremiah 38. Turning to the Book of Mormon, Mulek (or Muloch), the son of king Zedekiah (Helaman 6:10; 8:21; cf. 1 Nephi 1:4), makes his first appearance in Mosiah 25. According to the Nephite record, Mulek escaped the massacre of his family at the hands of the Babylonians (cf. 2 Kings 25:1–7) and established a colony in the New World in a region later named Zarahemla, after one of Mulek’s descendants (Mosiah 25:1–5). Upon their discovery, the so-called Mulekites joined with the Nephites and accepted Mosiah as their king (Omni 1:12–19). The name Mulek is not found in the King James Version of the Bible. Still, some Latter-day Saint scholars have proposed that Mulek is a hypocoristic (abbreviated or shortened) form of Malchiah/Malkiyahu, or a form of this name that dropped the divine name (yhw) element, leaving only mlk (meaning “king”). (Hebrew during the time of Nephi and Lehi was written without vowels.) If the Bible’s Malchiah is the same person as the Book of Mormon’s Mulek, then the stamp seal belonging to Malkiyahu would lend independent credibility to the historical existence of Mulek. Although impossible to definitively prove, Mulek can be seen as a very strong candidate for being one and the same as the Malchiah/Malkiyahu mentioned in the book of Jeremiah and on the stamp seal discovered in Jerusalem. While other unknown factors remain unresolved, such as Mulek’s age when he fled Jerusalem, these complications do not diminish the overall strength of the evidence presented above. Curtis Wright, “Mulek,” in The Encyclopedia of Mormonism, 4 vols., ed. Daniel H. Ludlow (New York, N. Y.: Macmillan, 1992), 2:969–970. Jeffrey R. Chadwick, “Has the Seal of Mulek Been Found?” Journal of Book of Mormon Studies 12, no. 2 (2003): 74. Royal Skousen, Analysis of Textual Variants of the Book of Mormon: Part Three, Mosiah 17–Alma 20 (Provo, UT: FARMS, 2006), 1464–1470. Robert F. Smith, “New Information about Mulek, Son of the King,” in Reexploring the Book of Mormon: A Decade of New Research (Salt Lake City, UT and Provo, UT: Deseret Book and FARMS, 1992), 142–144; John A. Tvedtnes, John Gee, and Matthew Roper, “Book of Mormon Names Attested in Ancient Hebrew Inscriptions,” Journal of Book of Mormon Studies 9, no. 1 (2000): 51; Chadwick, “Has the Seal of Mulek Been Found?” 73–74. Chadwick, “Has the Seal of Mulek Been Found?” 79. The non-Mormon epigrapher Kenneth Kitchen believes that Malkiyahu is indeed the son of Zedekiah, and is none other than the Malchiah of Jeremiah 38. See Kenneth A. Kitchen, On the Reliability of the Old Testament (Grand Rapids, Mich.: William B. Eerdmans, 2003), 21. H. Curtis Wright, “Mulek,” in The Encyclopedia of Mormonism, 4 vols., ed. Daniel H. Ludlow (New York, NY: Macmillan, 1992), 2:969. See Book of Mormon Central, “Who Called Ishmael’s Burial Place Nahom? (1 Nephi 16:34),” KnoWhy 19 (January 26, 2016). Chadwick, “Has the Seal of Mulek Been Found?” 83. All this latest interest in ancient Old World evidence is really exciting - first all the archaelogical discoveries in Oman (see Lehi in Arabia at www.lehiinarabia.com and now this. Not expecting any concrete proof to be found but the research is really interesting!